I was given the recipe for this Kuku-ye Morgh, Chicken Kuku, a few months ago by Mrs. Solhjou whom I met through a charity organization. I cut the original recipe in half simply because it was too much to make for just the two of us. It is simply delicious and very very very easy to make. Each quarter of this kuku makes a perfect meal with a little salad on the side. It’s delicious and filling, that’s for sure!! 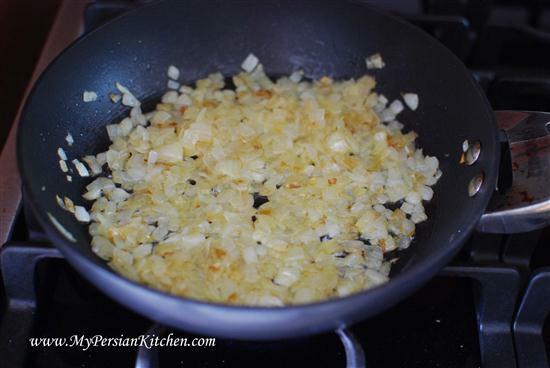 Saute fine chopped onion in some oil until nice and golden. Pretend that there is a picture here with the following in it: a pot with chicken legs seasoned with salt and pepper, 1/4 of an onion, and 1/4 cup of water simmering away. Once the chicken is cooked remove from the pot, debone and shred. 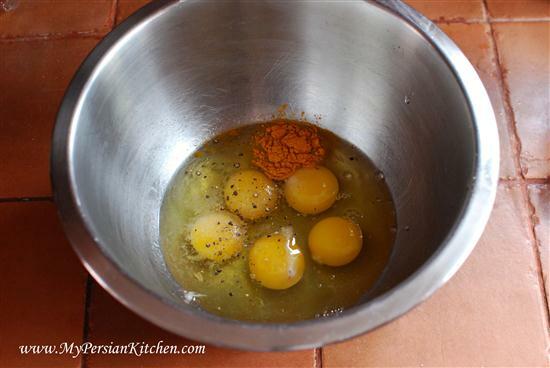 Beat eggs with turmeric, baking powder, lemon juice salt, and pepper. 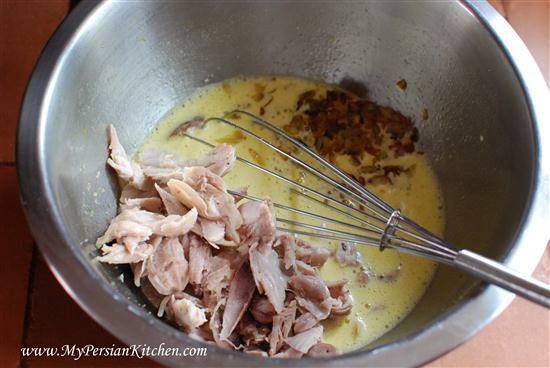 Add shredded chicken and onion to the egg mixture and mix well. In a non-stick pan warm some oil. When the oil is nice and hot pour egg mixture in and cook covered on medium for about 15 to 20 minutes. Cut the kuku into four different section and flip over. Cook for another five minutes covered. And that’s it!! 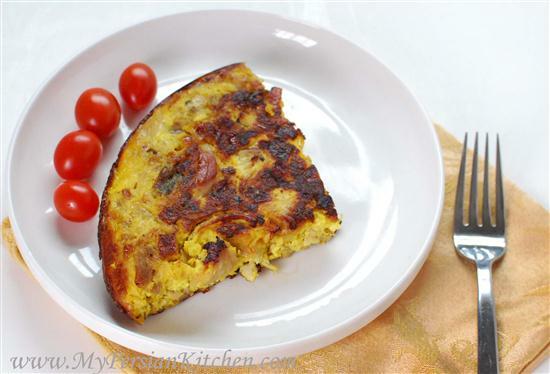 A delicious kuku that is very easy to make. This kuku is also a great way to use up left over chicken! We normally make khoresht out of this! So good. I think you just motivated me to make this over the weekend. @ Laila, I love your blog and the fact that you have introduced me to all the dishes that you grew up eating!! I am so going to make this!! @ Farah, make it and let me know how it is!!! 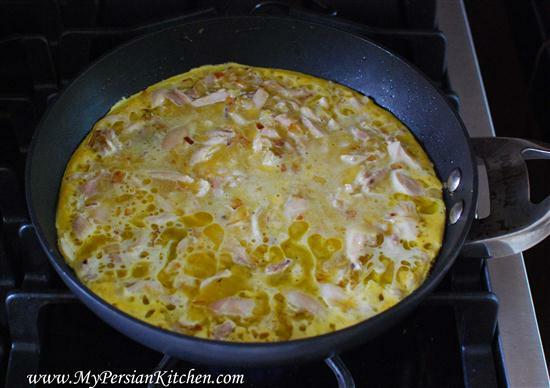 @”my persian kitchen” – thanks for all the information …cooking history and all. I stumbled on your blog through Azita’s Turmeric & Saffron, and was really delighted to see this post! 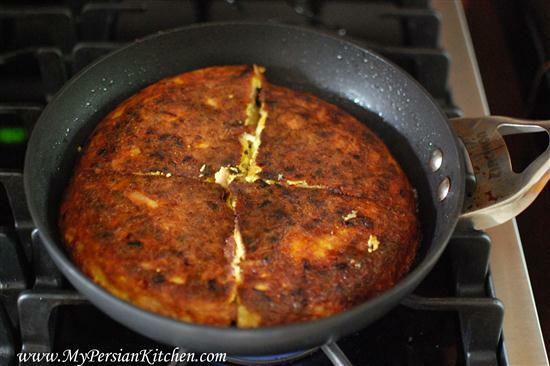 It brought back memories of my grandmother making chicken, fish or potato varieties on this… thanks so much for sharing the love for Persian cuisine. @raquel, if you click on the link that Laila left in her comment, it’ll take you to her blog! @ Azarakhsh, welcome!! Thank you for your kind worlds! I just made a big batch of chicken broth. Made some olvieh with a portion of the chicken and couldn’t figure out what to do with the rest. I ran to the kitchen and made this in 15 minutes as soon as I saw your post. My kuku is now cooking in the oven. Okay, I decided I am making it tomorrow- cooking the chicken right now. I will add fresh herbs like the veggie kuku and try to cook it using less oil than my usual (you know, new years resolutions and all…hahaha!). I’ll let you know how it turns out for sure. Really excited to try this! Farah, so happy the recipe turned out well! My Mom will be happy to know I will be cooking dinner tonight! What a gorgeous blog you have here I also have a Middle Eastern food blog called Ya Salam Cooking. I just started a foodie forum and wanted to invite you. @ Snowgrouse, so happy your first try was a success!! I am so glad you liked this recipe! @ Maryam, welcome! Let me know how your kuku came out! @ Noor, thanks! I will check out your forum. Shayma joon, happy new year to you too!! Yes, sunny California indeed, although, it has been rather chilly around here this year! I love your website. Im a iranian women from Norway. I can taste the food as I read the ingredients of your recipe! Thank you. Please tell me the website to buy package spices, rose buds and tea infusion pot, cup to drink tea sounding like….Khalamara…. ?